Before we even moved into our new house, I knew the closet was going to be an issue for me.😳 As someone who loves fashion, I have gathered quite the collection of clothes, shoes and accessories over the years. Now that we are in the new house, the guest bedroom which derrick previously used for his clothes, is a lot further away from our master. Which meant he was moving in to the new master closet with me.😱😆 Not only that, but now we share our dresser in the master, which means I lost drawer space as well. I know that none of this is a real life problem, but it was something I had my heart set on finding a solution to.🤷🏽‍♀️ Although this was a new build, our floor plan did not allow for us to move the closet around. Derrick already agreed to re-do our closet once we moved in, because he knew that was my special space.✨ I’m so thankful to have someone who is so supportive, and he knows he gets his man cave.😆 Win-win for us! We knew we didn’t want to spend too much money because we still have other things we need to complete in the house. I was nervous that we were going to either spend too much, or not get what we wanted. 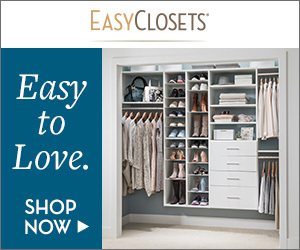 After about a month or more of research, I finally found a site that let me design a completely custom closet! 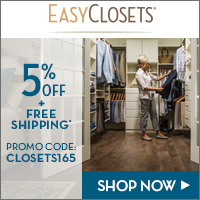 We decided to use Easy Closets and I would have to say, the process was fairly easy. First you have to Start a Design, and decide if you want to have someone assist you, or if you want to do it yourself. Since I already had a design in my head of what I wanted, I decided to do the design myself. They give you 3 options of closet design, a reach-in, walk-in or draw your own. Since our closet is not the typical walk in (we have a door from our master bath and a door into our laundry room), I decided to draw my own. I measured our entire closet (walls and ceiling height), including space for the doors. This step is super important to make sure your design fits exactly in your space and works for what you need. Using their tool, you draw out the floor plan of your closet. After the floor plan is complete, you can add units to the walls you want to utilize. The site will warn you when your units won’t fit, or if they will cause overlap where the clothes hang. I came up with the below plan for where I wanted the units. The open wall you see is for shoe shelves that I already have. Once you have your layout ready, you can go in and actually design each unit. I customized each section to make sure it was exactly how I wanted it. They start with everything at 84” high, but we have 9’ ceilings, so I opted for 94” high units. I also knew we needed more drawer space, so we added drawers as well. I measured my clothes so I knew that they would fit in each space, and how much hanging space I needed. I changed around the designs so many times before we finally decided on the final layout. After finalizing the layout, we got to the pick the colors, style and hardware. We went with a traditional white and matte nickel hardware. We wanted to keep the room as bright as possible since it was going to be very full. After we made sure that the design was exactly what we were looking for, we checked out and ordered our closet. The next day after receiving our confirmation, I actually had one of the design employees call me, and notified me of the design recommended changes to our plan. At first I was nervous they were going to try to sell us on something else, but she was so helpful! She explained that we needed toe kicks under our drawers, and that extending the units didn’t really serve a stability purpose like we had thought. The company sends L-brackets for stability, so we actually ended up saving $150 by not extending the unit walls all the way to the ground where it wasn’t necessary! Two days after our order, we received our shipment of materials for us to assemble our new closet. One thing I do want to note is our specific design ended up coming in 19 different boxes! I was a little overwhelmed at first, but in the box the label as “OPEN FIRST” was our personalized instructions. After reading through them, I realized that it wasn’t as complicated as I was making it seem. They tell you exactly what you need, including tools. We didn’t use end up using the square out of the recommended items, but that was the only piece. We also didn’t use any of the recommended items, but if you have to remove baseboards I would recommend having the pry bar and a razor blade. We had ours still at the old house so we used a flat head screwdriver instead of a pry bar. Our house came with these cheaper wire racks installed, so we first had to remove those. I just watched a YouTube video on the best way to remove them from the wall. After that we removed the baseboard molding from the areas where our closet units went to the floor. This allowed the unit to sit flush against the wall. After prepping our closet, we were ready to begin! The personalized step-by-step instructions were surprisingly easy to follow. They provide you with all of the details for your plan, and the specific materials. Each individual box was labeled, so we knew which pieces we needed out of each. From beginning to end the project probably took us about 10 hours, and that includes removing our old closet system. The whole process was actually fairly straight forward, and the most difficult part was cutting the steel rail to hang the panels on. Thankfully I had a strong man to help with that part! If I had to give any tips, I would say to make sure you measure carefully! We tried to follow the old saying of measure twice, cut once. Your design outcome will depend on your attention to those details, and thankfully I couldn’t be happier with ours! We can now share our closet with ease, and I love the way it looks! The best part is we did it ourselves! I am so proud, and I can’t wait to show everyone who comes over!